Happy Friday!!! 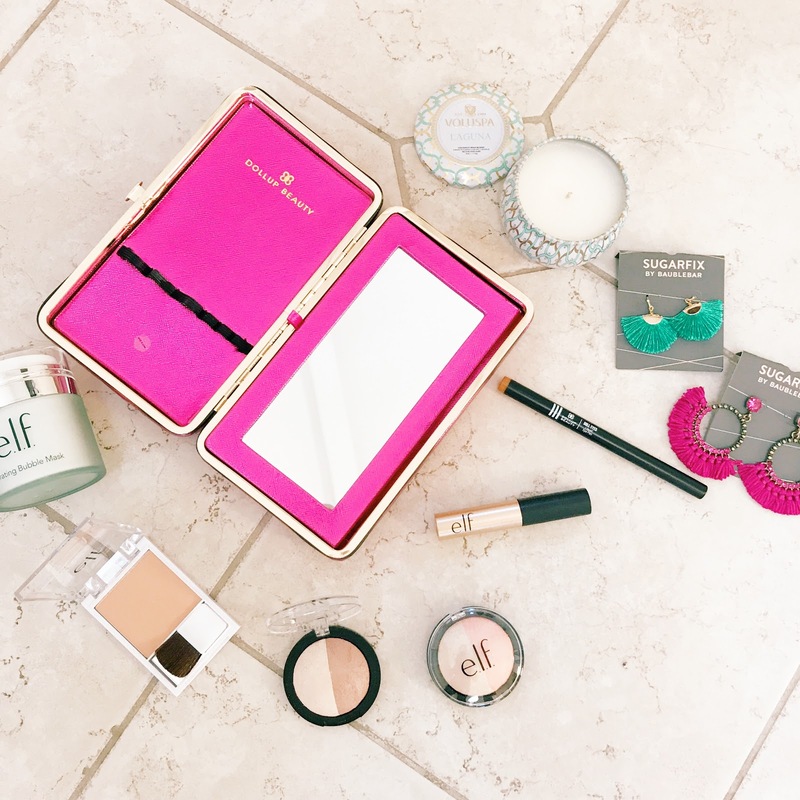 I wanted to share with you my favorite products this week!! And this week it's all about beauty!!! How fun is the Dollup Case? This adorable makeup organizer is the perfect portable vanity for everything you need to dollup, touch-up and go! The hard case design protects and secures your daily essentials—no more dirty or broken cosmetics—while a convenient hinge feature allows the case to open flat for easy access to all your makeup. And how cute is this color? You have to check it out!!! I am obsessed with e.l.f. makeup products. I love that all e.l.f. Skincare products are free from Parabens, Sulfates, and Phthalates! Cruelty free and vegan. This hydrating bubble mask.is a hydrating and nourishing gel that transforms into a bubble mask on the face to remove excess dirt and cleanse pores for glowing, healthy looking skin. The Baked Highlighter and Blush duo help give a natural-looking blushed glow. Voluspa Candle in Laguna-- I love this scent and I have these candles all over my house. Sugarfix by Baublebar Earrings-- How fun are these! and these! I love the style and the colors. They are that pop of color I need to add to my looks!!! You can shop my favorites by clicking on the links above. Happy Reading!!!! I can't believe September is coming to an end and Fall is officially here. Fall is my favorite time of the year. It's the time for pumpkins (and pumpkin spice lattes of course), Halloween and my birthday. So much fun. Here is my Instagram and blog round up of all of my September looks. 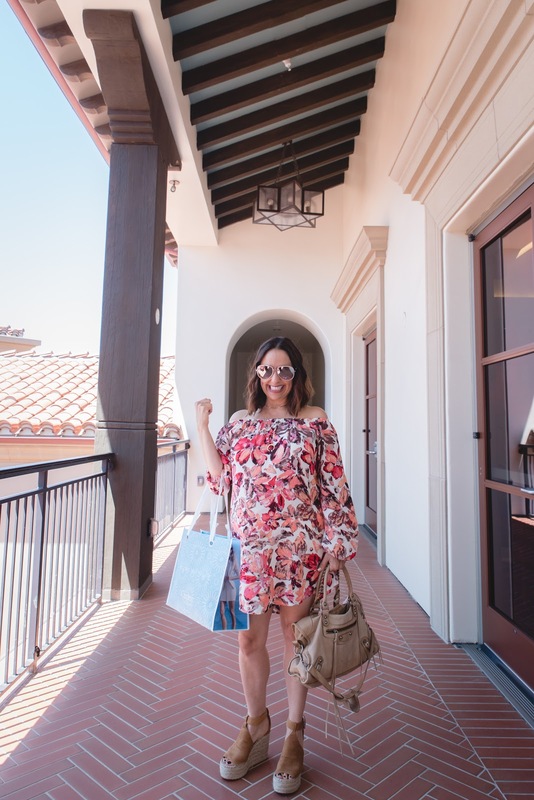 I loved throwing my blogger brunch at the Outlets of San Clemente. You can read all about it here. This is my all time favorite suede jacket!! So cute right? You can shop it here. 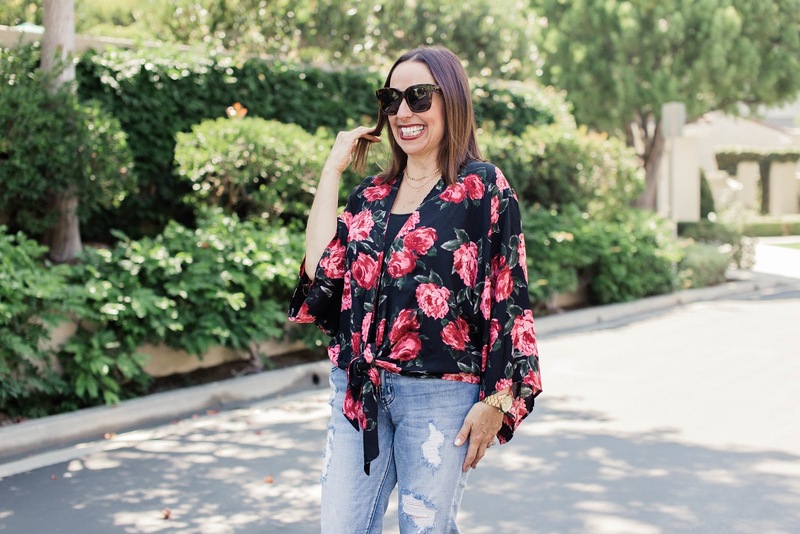 I am obsessed with this floral print and tie front detail You can read about it here. 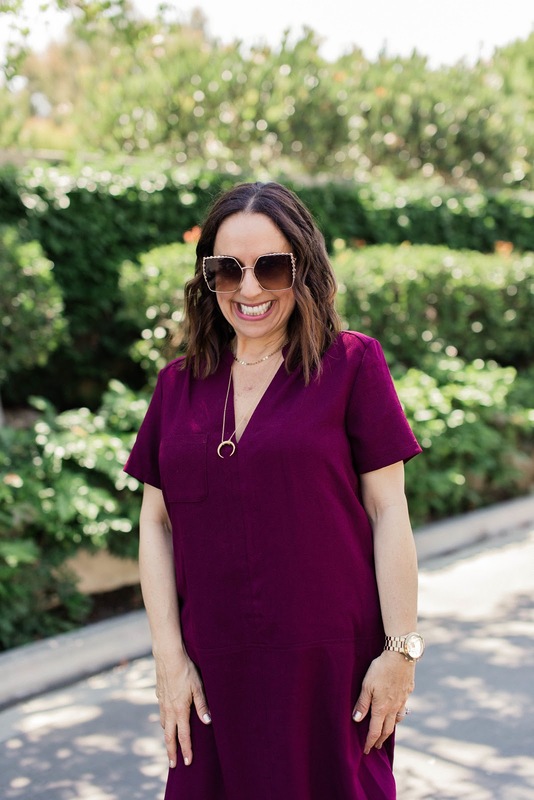 I love Burgundy for fall!! Shop this adorable dress here. 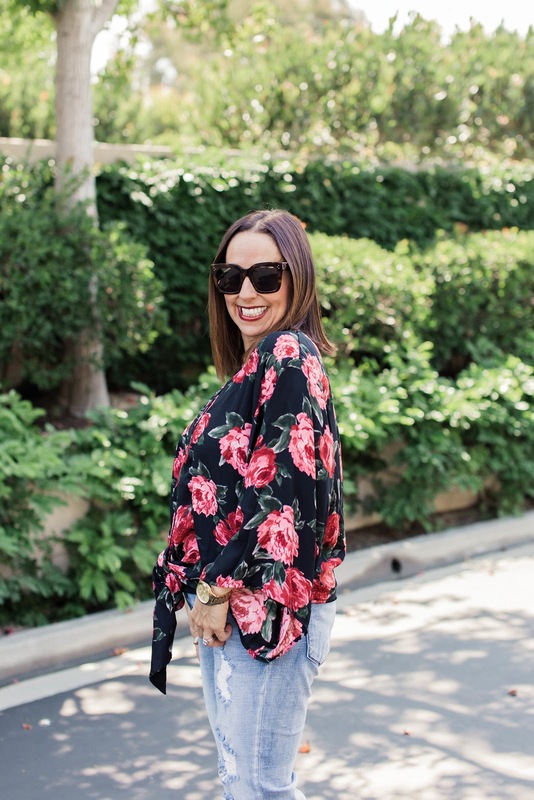 This post is all about transitioning your basic shorts into the fall months. Read more here. And how fun is this slip dress? It's all about layering it with this Moto jacket for fall. Read more here. What are your favorite looks? I want to hear. Let me know in the comments. Thanks to Gabi Wells for photos. You can shop these looks by clicking the links in the posts above. Happy Reading!!!! I love a great slip dress and I was lucky enough to pick this one up at the Nordstrom sale. 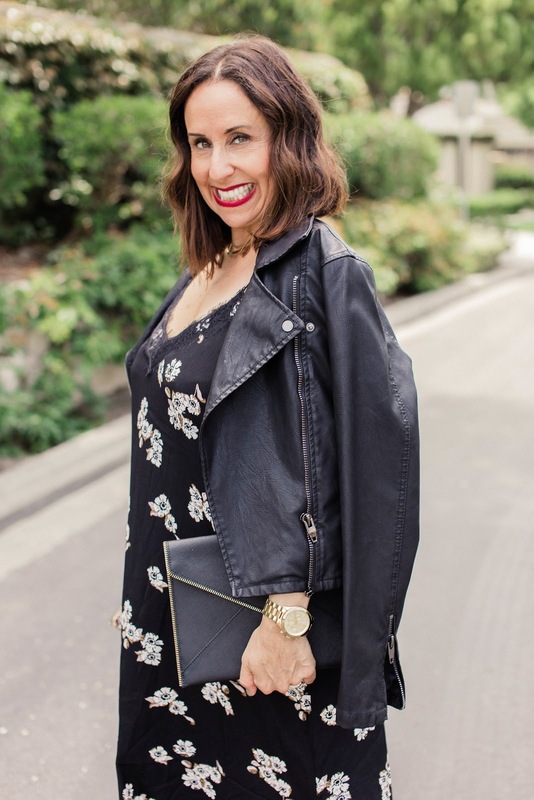 A perfect way to extend the life of your summer dress is adding a funky Moto leather jacket and some mules. This changes up the whole look for fall. Am I right? And can we talk about how important it is to invest in a Moto leather jacket? It literally goes with EVERYTHING!! It is my go to piece all year long. 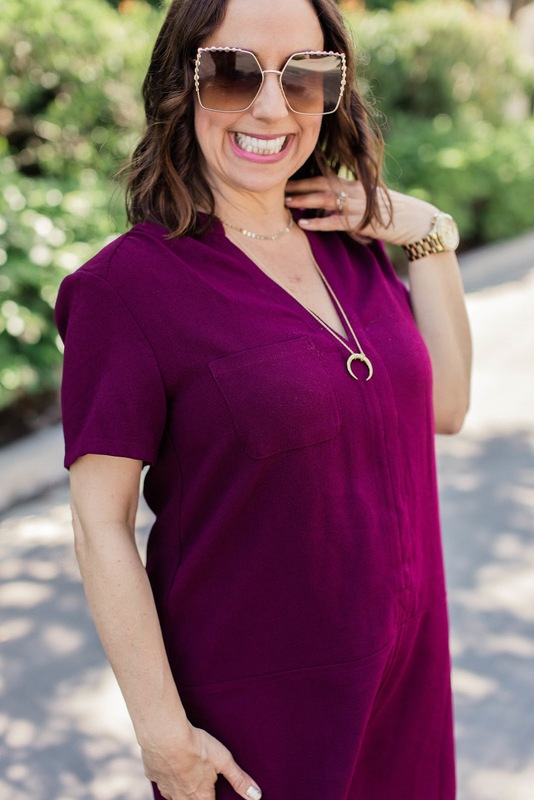 Not only can you wear it on your shoulders and get a chic look over a dress like I did here, but you can pair it with a t-shirt and jeans, or over a dressier shirt and pants. It really is such a versatile piece and you all need one. This one by Blank NYC is my all time favorite. And a great shoe to add to your fall wardrobe is a comfy mule. These Mercer Edit mules are so easy to add to any dress, denim skirt or some skinnies. I can walk in them all day. I want to hear about the ways you layer to create a fall look. Let me know. Thanks to Gabi Wells for photos. You can shop this look by clicking on the links above. Happy Reading!!!! Happy Wednesday!!! 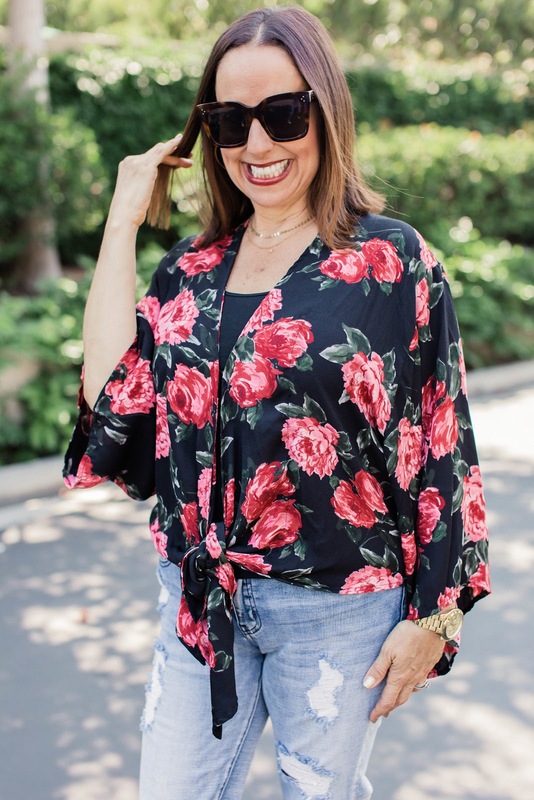 And what a fun way to celebrate-- bringing in fall with a great blazer and some shorts. 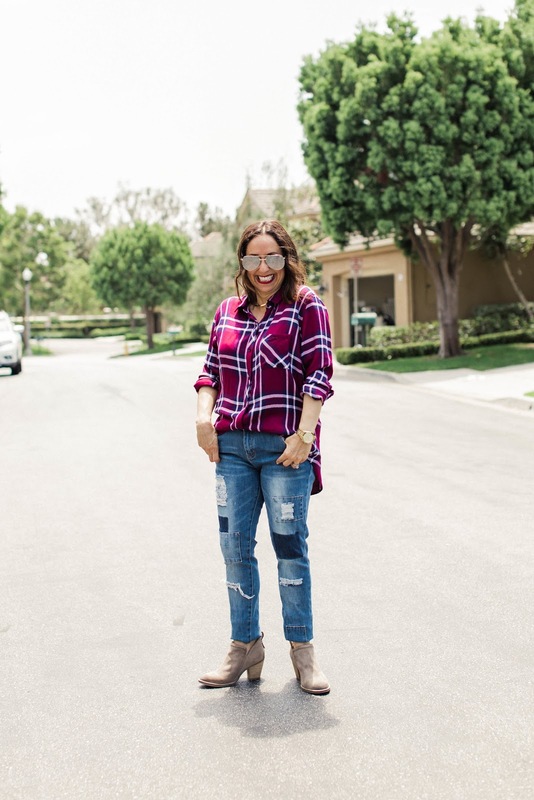 This is the perfect transition outfit to take pieces from summer into fall. How cute is this Vici blazer? I love the gold button details. I paired it with these must have shorts from Alice and Olivia (my absolute faves) and a basic white tank. Adding these amazing heels really completed this look. I highly recommend that you find some black shorts in your closet and take them into fall by pairing them with a blazer and some heels. I Let me know what you think. You can shop this look by clicking on the links above. Thanks to Gabi Wells for photos and Happy Reading!!!!! 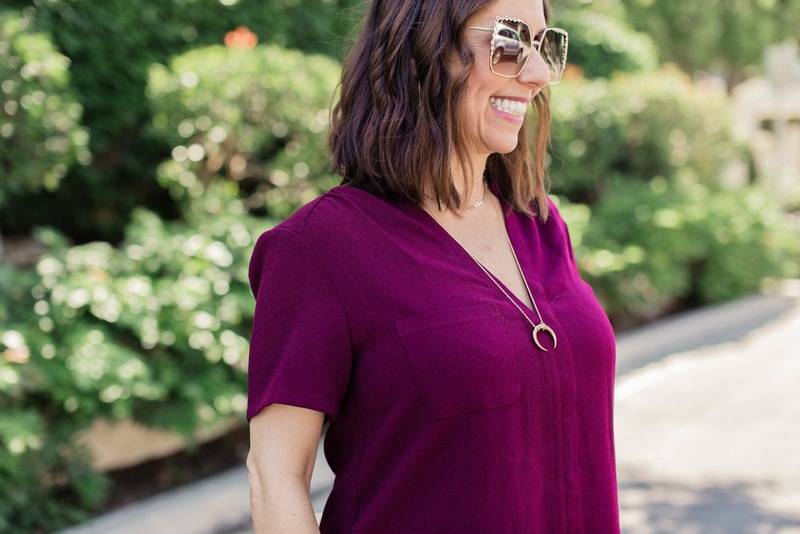 Don't you love this shade of Burgundy? I think it's one of my favorite colors for fall. And how perfect is this fun shift dress. I highly recommend investing in a good shift dress for fall. It goes perfect with booties or knee high boots. And adding a Moto leather jacket will change up this look in the cooler upcoming months. I added my favorite lace up booties in taupe. It can be challenging to figure out what shoes match best with red and burgundy tones. Taupe is such a great neutral. And these lace ups are just so comfortable. I also love mixing things up with different sunglasses. These are from BP and I love the square frames. What is your go to fall dress? I love the shift, but I want to hear what you think. 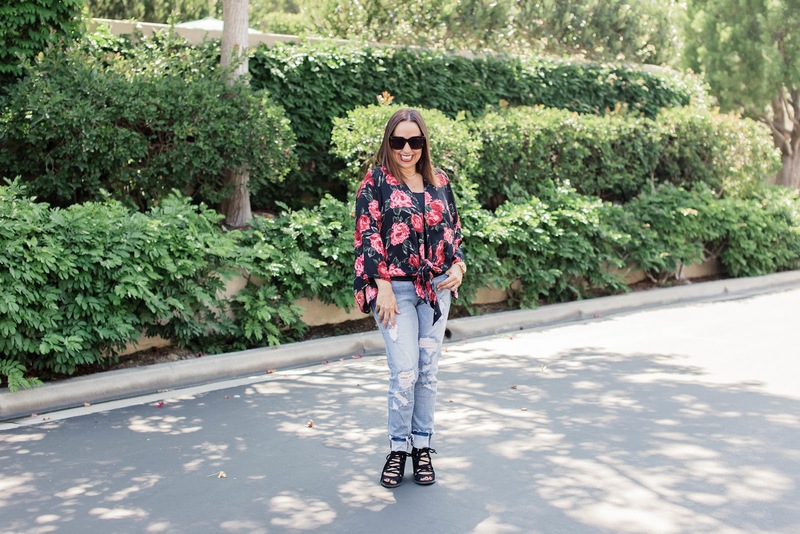 Thanks to Gabi Wells for photos/ You can shop this look by clicking on the links above. Happy Reading!!!! I am just so excited for Fall. I know its still hot in the OC but Fall is just around the corner and it's my favorite time of the year. I love the cooler weather so I can bring out my cute jackets, sweaters, long sleeved shirts and boots. I also love Halloween and of course Pumpkin Spice Lattes from Starbucks. What are your favorite things about Fall? 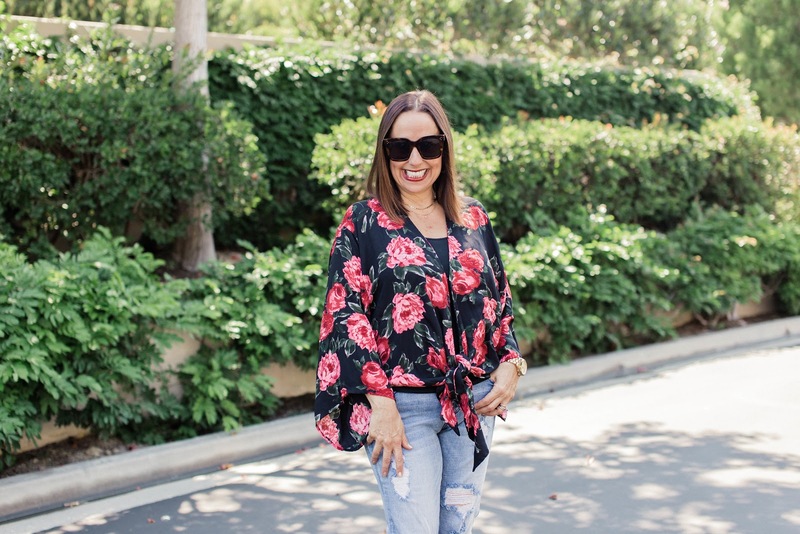 I thought this floral tie front top from Vici was there perfect way to begin my excitement for Fall. How cute is this print and tie front design? This is a big trend for fall. Have you seen tie front tops around? It is so flattering and can be worn by any body type. 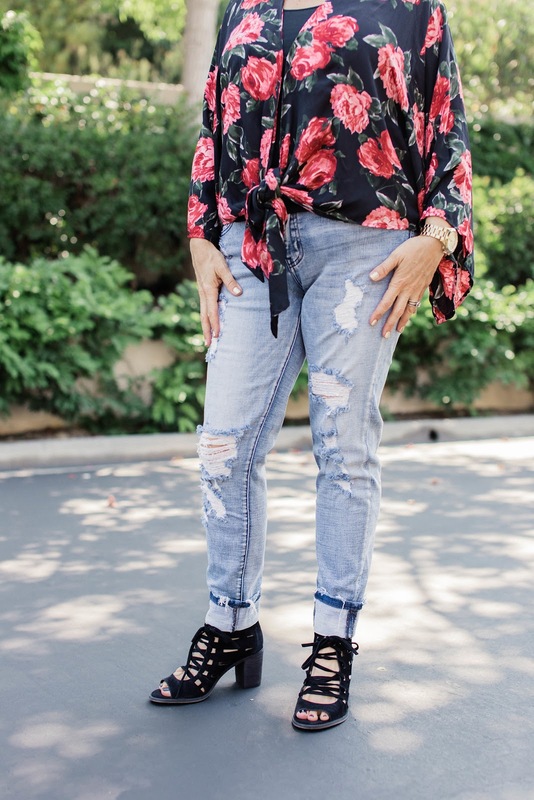 I paired this top with some cute Vici skinny jeans (I've been really into this light wash lately), and these cute lace up booties. 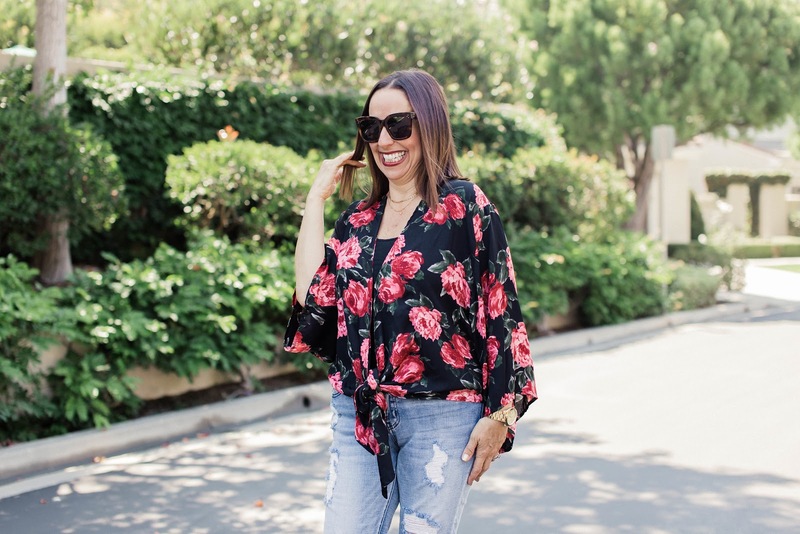 It is such an easy look that I can wear day or night. I hope you check out this cute new trend and let me know what you think. Thanks to Gabi Wells for photos. You can shop this look by clicking on the links above. Happy Reading!!! !